Commodus. BRONZE MEDALLION of AD 183. Probably for military events in England. Medallions were awards, very likely personally presented by the Emperors. 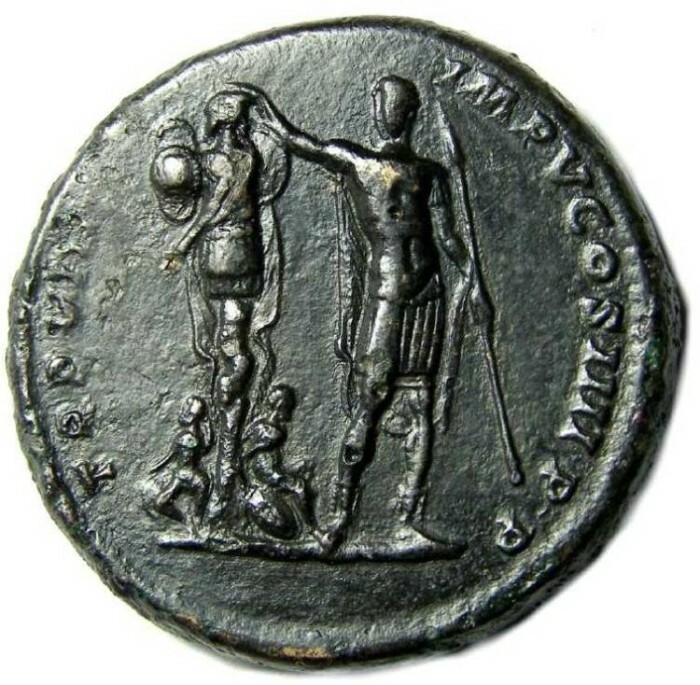 In this case, the medallion shows Commodus presenting a military trophy, meaning it was probably presented to an officer in the Roman Army as the Roman equivalent of a modern military medal. Size : 47.8 x 49.7 mm. Weight : 46.28 grams. Grade : gVF with a nearly full strike. The fields have been smoothed and there may be some minor tooling of some parts of the designs. This medallion was sold at auction earlier this year with comments about it having more extensive tooling, but the auction company had miss-identified which medallion it was and was comparing it to examples of a different medallion when they made that determination. Under magnification I see no clear evidence that such extensive tooling actually exists on it. Obverse : Draped and Cuirassed bust of Commodus right, with M AVREL COMMODVS ANTONINVS AVG around. 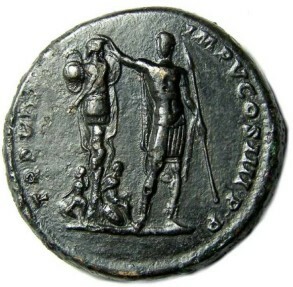 Reverse : Commodus standing slightly right, with his head turned left, extending his his arm out over a military trophy to his left, and holding a spear to his right. Around this all is the inscription TRP VIIII IMP V COS IIII P P.
When you first look at the medallion, the inscription appears to be TRP VIII but on careful examination there are traces of a 4th "I" that did not strike up well (although it may have been clearer when this medallion was freshly struck.). If you click on the image of the reverse at the bottom, you can see traces of it on the enlargement (it is even clearer with the medal in hand). Reference : The TRP VIIII makes this Cohen #913. The earlier attribution to Cohen #868 was in error based on not noticing the traces of the 4th I, and thus assuming it is only TRP VIII. Dating : Early in AD 183. TRP VIIII which begins very early in AD 183, it lacks the title PIUS which Commodus also adopted early that year. That placing it during a very brief period between the adoption of the two titles that year. Historical Significance : The theme of this medallion is a military trophy being awarded, but not a victory commemorative for the successful conclusion of a war (those also exist and tend to have figures of Victory, and/or VICT as part of the reverse inscriptions). Thus I believe this medallion was awarded for a specific battle won as part of an on-going war, some time in late AD 182 or very early in 183. 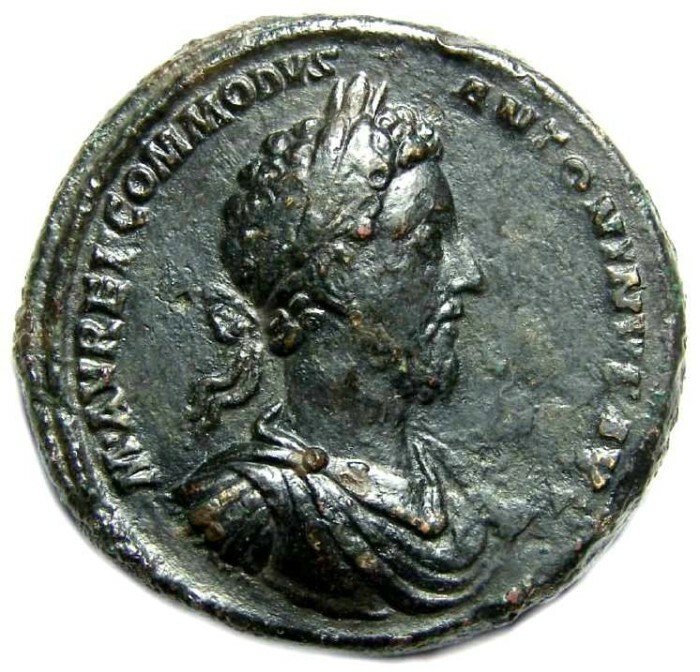 By early AD 182 all of Commodus' military campaigns were concluded, with the exception of the British rebellion which started on AD 180 was continued until AD 185, so I feel it is reasonable to assume it relates to a battle during that British war. Unfortunately, the details of the British war are not recorded beyond the most basic facts. We know it started at least as early as AD 180 when Barbarians breached Hadrian's wall, but and possibly as early as AD 175 as suggest by a record of 5500 Samaritan Calvary being sent there that year. Some time in AD 183 they were forced to retreat to the Antonine wall back to Hadrian's well. Then in AD 184 Ulpius Marcellus was sent to replace the Governor there, only to have his own troupes rebel against him. Then finally in AD 185 the war was brought to a successful conclusion, at which time VICT BRIT coins and medallion were also issued. This British war may have had many battles that are not recorded in history, and while we cannot tie this medallion to any specific battle, attributing it to that British war is not unreasonable given the date at which it was issued.